Newsgroups, or rather USEr NETwork newsgroups are not new, this is a common mistake by newbies under the impression that its a new alternative to p2p. Just because you've never heard of them, that is likely due to your lack of exposer to computing on a larger or historical scale. In fact, usenet newgroups are actually far, far older than the WWW and the http protocol. Data is served over the nntp protocol, primarily designed for text and discussion at technical institutions and universities.. the main priniciple is large data servers that sync messages between other large data servers, with the messages split by groups. The technology requires data posted by one user to propagate to your isps/hosts newsgroup server. I won't repeat this all, you can find out detailed background at Wikipedia. Just wanted to present the fact that usenet newsgroups are not new, and the posting of binaries was later developed on top of the network. Usenet was originally created to distribute text content encoded in the 7-bit ASCII character set. With the help of programs that encode 8-bit values into ASCII, it became practical to distribute binary files content. Binary posts, due to their size and dubious copyright status, were in time restricted to specific newsgroups, making it easier for administrators to allow or disallow the traffic. The oldest widely used encoding method is uuencode, from the Unix uucp package. In the late 1980s Usenet articles were often limited to 60,000 characters, and larger hard limits exist today. Files are therefore commonly split into sections that require reassembly by the reader. The standard method of uploading binary content to Usenet is to first archive the files into RAR archives (for large files usually in 20 MB or 50 MB parts) then create Parchive files. Parity files are used to recreate missing data. This is needed often, as not every part of the files reach a server. These are all then encoded into yEnc and uploaded to the selected binary groups. Your concern here is likely binaries. Because of the limitation on message size, binary data is stored across several message posts and reconstructed by your news client. Corruption is a distinct possibility because, for example, if your file is not on the servers anymore (retention ranges from days to several months, depending on how much you pay for access) you'll have messages that make up part of a file missing from the binary. There's a simple method of parity to recover corruption. NZBs were introduced to save bandwidth to get content. You do not need to subscribe to a group and download headers anymore to see what content is available. Like the introduction of ed2k links with edonkey2000 that meant you no longer had to rely on searching the network to find data, nzbs were introduced so you didn't have to download all the headers for messages and select and download to start a download from newsgroups. An nzb file is similar to a torrent file in many ways, the file itself does not contain any useful information beyond when you maybe able to connect to get the data. A nzb may point to data that isn't there, or isn't on your isp server. Its up to you and your newsgroup client to acquire the data. As far as nzbs go, you need to understand that the file just says which group the content is located, the message details, etc. Just metadata. You will need a client that can understand and download the content referred to in the nzb file. The concept of parity should be okay with anyone in a technical or mathematical field. Its basic checksum maths. How par2 files work is the releaser states a certain amount of parity and upload those files for users to be able to repair any missing data they have. Checksums are done on parts of files called blocks. When you run the par2 file you'll checksum your files for corruption. If you have corruption, you'll be told you require xyz blocks. You'll need to get the number of corresponding par2 files. Blocks are indicated by the +xy at the end of parity files. For example if you need 11 blocks, you can grab any number of par2 files that add up to 11blocks or more, ie. +01 and +10, or just one +12, etc. 3) Setup a folder to load nzb files from, useful if your setting up nzb on a remote pc like me. You can put nzbs in here for them to load into newsbin. If your nzb is called horror.nzb, it will download the rars into a folder called horror. 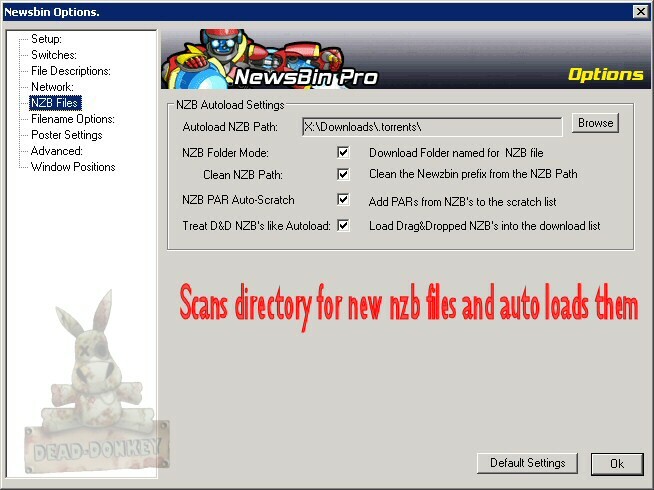 If your on a local pc you can just open nzb with newsbin for them to be added, but i'd still setup a folder to load nzb from. Scratch tab is where your par files from nzbs are added. To download from the scratch, right click a file and click Add to Download. ISPs are rarely able to provide a decent fill rate, although you may be able to get things like tv episodes for the past day or so given their popularity. The buggers haven't honoured the referral scheme. Anyone who has been referred by you just needs to email us with their username and your referral ID stating you have referred them. Anymore links that I should check out? http://nzbmatrix.com/index.php offers 20 NZB downloads per day for registered users. http://www.newzleech.com/ is similar to Binsearch, but I find that it shows new uploads quicker. Anyone able to help me out with the following? I downloaded a rar-file which I found through eMule search. Unfortunately, it is passworded and I don't know the password. 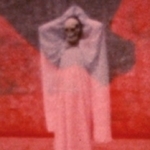 Apparently, it was posted on Usenet, so I was wondering if someone could check if the password was posted here too. If nobody can tell you the password, you could try a password cracking software. There are some especially made for archives like this. Yes, I have seen those. Most of them can't crack anything complicated however. And if they can, it can take months before they find it. So you'd need to know the specific file; and i can check. Thanks, spud Tell me what you need more: I posted the ed2k link to it, so you have name, size and hash already. What else? I'll give you cookies! Its been retagged, repacked, etc. newsgroups have binary limits; ie. you've posted something not from news. The guy who has taken it from news has taken another release, tagged in and repacked it putting a password on it. Well, I found the password. It was somewhere in a WinRAR screen. So, yay! I'm happy now! Thx for support!